The Old Stables in Swafield, near North Walsham, Norfolk sleeps 4 people. The Old Stables near North Walsham is adjacent to the owners’ home, and has been restored to retain its period charm; features include beams, and exposed flint and brick, whilst hosting a contemporary finish and very comfortable furnishings. The kitchen leads out to the enclosed lawn garden with steps to hot tub. Guest can relax and unwind on the large comfy sofa, or enjoy time sat out on the patio. Maybe even a tranquil night under the stars relaxing in the hot tub, whatever takes your fancy, The Old Stables caters for everybody. This holiday home is situated on the edge of the owners’ livery yard, which houses ponies and horses. The property provides excellent walking direct from the doorstep, and miles of footpaths and trails to explore, including local woods, footpath, Dilham land and Dilham Canal. 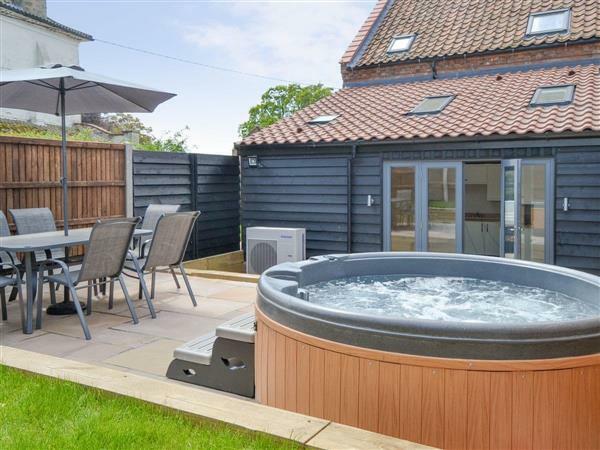 It is situated in an ideal location to explore the excellent sandy beach of the North Norfolk Coast and the Norfolk Broads, which are both within a 30-minute drive. The seaside village of Mundesley, 4 miles, has an excellent sandy beach, and the seaside resorts of Cromer and Sheringham, also house glorious sandy beaches and are host to many attractions, perfect for everyone. Cromer boasts a pier, with a carnival week which is held in August and, weather permitting, a spectacular New Year’s Day celebration, complete with fireworks. Sheringham is home to the North Norfolk Steam Railway, Splash fun pool and Sheringham Gardens. There are numerous bird sanctuaries, salt marshes and wildlife centres that punctuate the region, and the popular RSPB nature and bird reserve can be found near Cley next the Sea, Blakeney and Morston. Wroxham, 12 miles, is known as capital of the Norfolk Broads, and here there are daily boat hires and river trips available, riverside cafés, pubs and shops. The area around is a great place to enjoy all kinds of outdoor activities and sports. Bacton Wood, 2 miles, is great for walking and picnic opportunities. The market town of North Walsham, 2 miles, is perfect for guests to visit the supermarkets, shops, cafés, library and bank, as well as the vast bistro and gourmet eating establishments in the surrounding area. Enjoy a trip to the city of Norwich, 17 miles, where there is a fantastic castle museum, cathedral, excellent shopping, theatre, art galleries, cafés, pubs and restaurants. Places of historical interest and stately homes can be found within easy driving distance, and Blickling Hall boast open air concerts during the summer season. Perfect for entertaining the younger generations, this property is also close to Banham Zoo, Wroxham Barns craft centre and play park, Dinosaur Adventure Park at Lenwade and BeWILDerwood at Horning. There are also many places within driving distance, ideal for walking your four-legged friends, including Blickling Park, where you can also enjoy lunch afterwards at the local pub. You will find the beach 4 miles from The Old Stables near North Walsham. With the shop, pub and restaurant 2 miles from The Old Stables. Living room: With Freeview TV and beams. Kitchen/dining room: With electric oven, electric hob, microwave, fridge/freezer, dishwasher, washer/dryer and French doors leading to patio. Air source central heating, electricity, bed linen, towels and Wi-Fi included. Welcome pack. Enclosed lawned garden with patio and garden furniture. Hot tub for 4 (private). Private parking for 2 cars. No smoking. Holidays at The Old Stables run from Friday to Friday. The Old Stables is in Norfolk; should you be on the lookout for a special offer, you can find all the special offers in Norfolk. It's always worth checking to see what is on offer at the moment. Do you want to holiday near The Old Stables (UKC3371), you can see other cottages within 25 miles of The Old Stables; have a look to find your perfect holiday location.